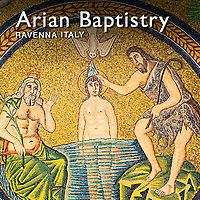 Pictures of the Arian Christian mosaics of the Arian Baptistry in Ravenna, Italy. The Arian Baptistry was build during the rule of the Ostrogoth Kin Theodoric the Great at the end of the 5th Century AD. The Arian Baptistry was part of a cathedral complex to commissioned by Theodoric of which only the baptistry survives today. Its walls interior is of simple brick and in the roof is a mosaic at the centre of which a beardless young Christ is being baptised by John the Baptist. Around this centre panel are two semi circular procession so Apostles and saints, one led by Saint Peter, the other by Saint Paul. They are walking towards a jewelled crucifix that is sitting on a purple cushion. Arian Christian preached that Jesus Christ is the son of God and was created by God the Father so was subordinate to him. Catholic Christian believe that Jesus Christ comes directly from God and is of the same substance and therefore equal to God. This may seem to be a moot point but it was contested bitterly in the Christian world of the time. Download Royalty Free stock photos of the mosaics of The Arian Baptistry or buy as photo wall art prints on line.